Although the 2019 Nissan NV200 isn't the most luxurious commercial van, it does bring a lot of positive attributes to the table. The compact NV200's easy parking and good gas mileage make it perfect for the companies that need to make regular deliveries. While the base NV200 will satisfy most buyers, a greater number of modern technologies are found on the SV model. Although the NV200 has become a popular choice, there are some other worthwhile small vans on today's market. Is the new Nissan NV200 a good match for your business? You won't find many changes on the 2019 Nissan NV. It's available features and drivetrain remain the same. If cost is a big concern, the 2019 Nissan NV200 may prove to be a great addition to your fleet. Prices start at around $23,000. This puts it right in line with rivals such as the Chevrolet City Express and the Ford Transit Connect. Good gas mileage also helps make the new NV200 an affordable choice. According to the EPA, you can anticipate getting acomobined 25 mpg on regular unleaded. Although the 2019 Nissan NV200 has no problem making frequent highway trips, it's perfectly matched for urban areas. It drives more like a compact car opposed to a truck-based commercial van. This means you'll have no trouble breezing around city traffic. A tight turning radius also helps the NV200 to squeeze in and out of tight spaces. Although no one will describe the four-cylinder NV200 as being powerful, it's great for cruising around. Over the years, the 2019 Nissan NV200 has proved to be a dependable workhouse. According to owners, major mechanical repairs are not common. Maintenance costs are also quite low. This is especially good news for the small business owners who're trying to maximize their profits. You can also take advantage of the van's solid warranty coverage. Nissan covers the powertrain for 5-years/100,000-miles. Most of the competition provides a shorter warranty. When loading and unloading cargo on an everyday basis, you need a van that's very functional. The Nissan NV200's rear cargo doors will certainly make your driver's job a bit easier. Drivers will find the doors to be especially helpful when unpacking near a busy street. A low, flat floor also helps workers to avoid straining their back. You will find several tie-down points on the inside, which helps secure items. The 2019 Nissan NV200 features blind-spot mirrors, which helps you to better see oncoming vehicles from the side. A downward-sloping hood and a large windshield further aids the driver's ability to see the entire road. Although your rearward visibility may not be quite as good, the standard backup camera will give you an extra set of eyes in tight spots. Rear parking sensors and a side window are available as options. Don't expect the NV200's interior to have an upscale appearance. Like most commercial vehicles, it focuses more on offering everyday practicality. Everyone will like this van's easy-to-use interior features. All of the components are straightforward. The various dials and knobs are a breeze to use. You will also appreciate the simplicity of the gauges. Meanwhile, accessible front seats enable workers to quickly hop in and out of the cab. In order to get the upgraded infotainment system with navigation, you must step up to the top-of-the-line SV model. If your drivers don't have the same route every week, this feature will prove to be a very beneficial upgrade. Nothing beats having reliable driving directions on hand at all times. A 5.8-inch touch screen replaces the 5.0-inch basic display. Voice controls enable drivers to keep their hands on the steering wheel at all times. You won't find any extravagant features inside the new NV200. Nevertheless, there are some popular goodies inside the SV model. As you may know, music can make the workday a lot less stressful. If you want to create a more upbeat environment, consider outfitting the 2019 Nissan NV200 with satellite radio. The upgraded infotainment system benefits from smartphone integration. Meanwhile, Bluetooth enables drivers to easily make calls while on the road. A 12-volt power outlet comes standard on the SV model. It's a simple feature that may prove to be a major convenience. If your business uses power equipment, the outlet will eliminate the need for you to find an external power source. If a second person isn't traveling with you, the fold-flat passenger seat will come in handy. It can actually be transformed into an in-vehicle workstation. A built-in tray gives drivers a place to put their laptop. All versions of the 2019 Nissan NV200 come equipped with a four-cylinder engine, which produces a little more than 130 horsepower. Despite its lightweight design, the NV200 is still a rather slow vehicle. While this van is ideal for carrying around light packages, a heavy load will cause a big drop in performance. If you need a more muscular commercial van, you may have to step up to the less efficient Nissan NV1500. It comes equipped with either a V6 or V8 engine. Unfortunately, the 2019 Nissan NV200 is not suitable for towing. This could be a deal breaker for the businesses who need to pull a trailer. It's simply not strong enough. You can use the larger Nissan NV1500 to tow up to nearly 7,000 pounds. 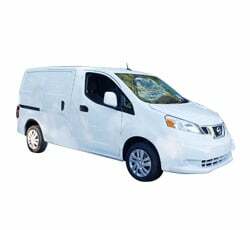 The 2019 Nissan NV200 is a basic work van that lacks advanced safety technologies. Although the blind-spot side mirrors are helpful, they can't match the effectiveness of a blind-spot monitor. You also can't get the NV200 with driving aids like forward collision warning and lane departure alert. If you desire these modern safety innovations, check out the new Mercedes-Benz Metris. Most drivers will have no issues with the real-world performance of the NV200's braking system. Nevertheless, it does not stop as quickly during panic situations. When tested in a closed setting, the 2019 Nissan NV200 needed nearly 140 feet to come to a complete halt. A vehicle that weighs 3,200 pounds should stop a lot quicker. The new Nissan NV200 sends power to its front wheel. While rainy weather will pose no issues for the NV200, it will not fare as well during wintry weather. If you happen to be in a snow-prone city such as Chicago or New York, an AWD-equipped van would deliver better traction. Before you buy a new 2019 Nissan NV200, first check out the 2019 Ram ProMaster City. A payload capacity of 1,886 pounds gives it a big edge over the NV200, which can only carry up to 1,480 pounds. You'll also benefit from the Ram ProMaster City's higher city fuel economy. The 2019 Ford Transit Connect is another small commercial van. Ford's Sync 3 infotainment system with Apple CarPlay and Android Auto is far more advanced than the NV200's infotainment system. Its voice controls work very well. On the downside, you'll notice the Ford Transit Connect consumes just a bit more fuel. Although the 2019 Mercedes-Benz Metris is the segment's most expensive model, you can't overlook its superior quality. The interior of the Metris feels far more upscale. Not only does the Mercedes-Benz Metris pack more performance, but it also offers a far greater number of premium features. Your workers will certainly prefer to being behind the wheel of the Mercedes-Benz Metris. The 2019 Nissan NV200 is an especially good commercial van for urban areas. It's easy to drive, efficient, and simple. Popular features, such as smartphone app integration and Bluetooth connectivity, are found on the costlier SV model. While the new NV200 is certainly worth the money, be mindful of its less powerful engine and dated interior design. Aside from a backup camera and rear parking sensors, no other modern safety technologies are available for the 2019 Nissan NV200.